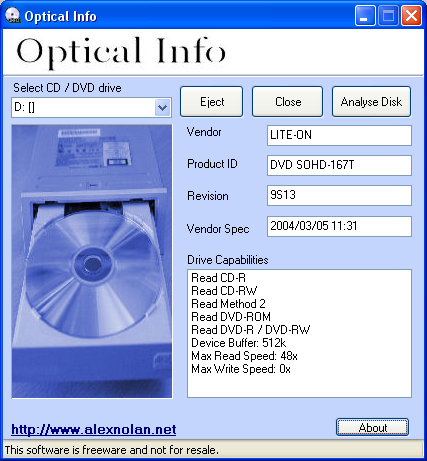 The purpose of this utility is to detect the optical drive's (CD / DVD drives) Read/Write capabilities. The purpose of this utility is to detect the optical drive's (CD / DVD drives) Read/Write capabilities. When looking at the front of a computer which is not your own it is often difficult to tell whether the optical drive installed is either a CD ROM, CD Writer, CD Rewriter, DVD ROM, CD Rewriter + DVD Combo, DVD/CD Rewriter etc. A utility like this is useful because CD and DVD drives don't often display their capabilities in the front and sometimes even if they do, they still can't been seen due to the design of the PC's case. People quite often have more than one optical drive installed in their machine. They can have for example the original CD ROM or Writer drive and also a newer DVD drive. Another advange of this utility is allows you to see by selecting the drive letter for one of the drives, which is which. It also allows you to see which of the two or more drives is the faster for reading / writing.